Dyson engineers are masters at re-imagining everyday tools and tasks. Case in point: the firm's new Airblade Tap hand dryer. 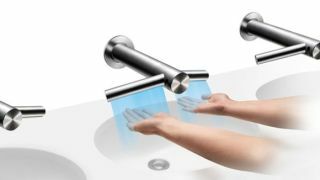 Capable of both washing and drying your hands, the tap releases water from the central stem and high-velocity air out of the two side-facing wings. As with other Airblade dryers, the pressurised air is designed to scrape the water off hands, not just blow at them with hot air. The result is drip-free bathroom floors and happier janitorial staff, we guess. With an R&D cost of $60-million (£40 million) for the integrated V4 motor, and an individual price-tag of $1,590 or £999 per tap, this is the hand-drying revolution you were not sure you needed, or wanted. This multi-million dollar development figure wasn't spent entirely on the the hand-drying tap though. Dyson is releasing three new Airblade dryers, including a 2.5kg lighter revision to the Airblade you find in bathrooms today, and the new Airblade V dryer, which is 60% smaller than current Dyson dryers. These dryers are also priced between $1,200 and $1,500. Fascinatingly, the Dyson team is boasting that its test team has had to simulate hand-drying over a billion times in the creation of the Airblade technology. We can only imagine the prune-like fingers those poor sods must have.